Since I’m new to blogging about plants (only 27 published posts) and currently enjoying a tiny readership, you might be wondering why I would choose to write a second post about the Crimson River Lilly. Well, my clump of the cultivar ‘Oregon Sunset’ continues to impress. When I first wrote about this plant in January of this year, my clump had been stellar, blooming through the fall of 2012 and well into January. Sporadic blooming continued in February and March and was followed by a very dry summer when flowering stopped. Nevertheless the strap-like leaves were a nice foil to summer bloomers. 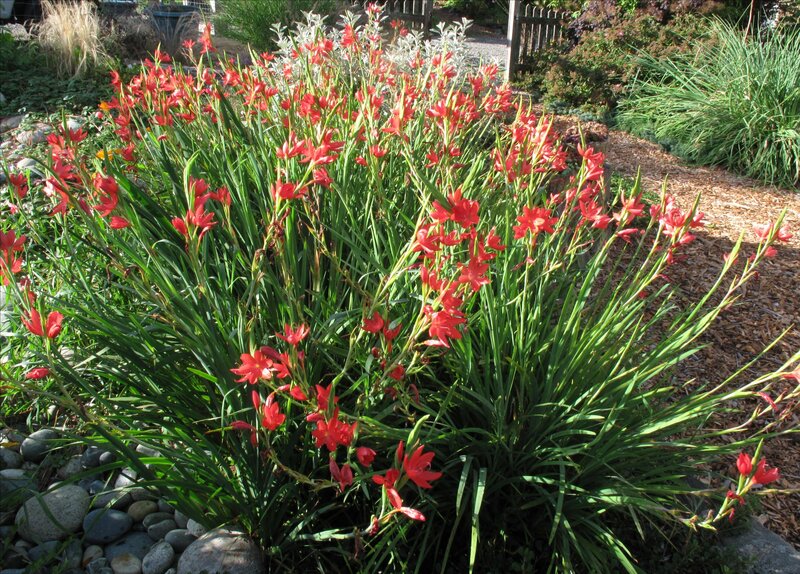 A new cycle of fall blooms began about four weeks ago as flowering stems began to make an appearance. I responded with a bit more watering (our late summer was exceedingly dry) and by late August and early September much needed rainfall made an appearance. New blooms on each stem open from the bottom up so it’s easy to clean up older stems by simple deadheading the spent flowers at the bottom of the stalk followed by snipping out the spent stems. If you choose, you can easily skip deadheading and periodically spend a few minutes culling out the stems that are done. I’m convinced the clump responds by sending up new flowering stems. Oh yes, why use redux in the title of this post rather than simply calling the post “Crimson River Lilly Revisited?” Well, at the risk of appealing to the literati: Redux comes from the Latin “reducere,” which is often translated as brought back or restored. Since the word is now most often associated with literature (John Updike’s Rabbit Redux), movies (Francis Ford Copola’s Apocalypse Now Redux) and music, I thought it might be nice to expand the usage to plant blogs. We plant folk often learn a bit of Latin ourselves as we struggle to understand the Latin (and Greek) binomials. Let’s not forget that those Genus and Species name do tell us a bit about the plants characteristics. 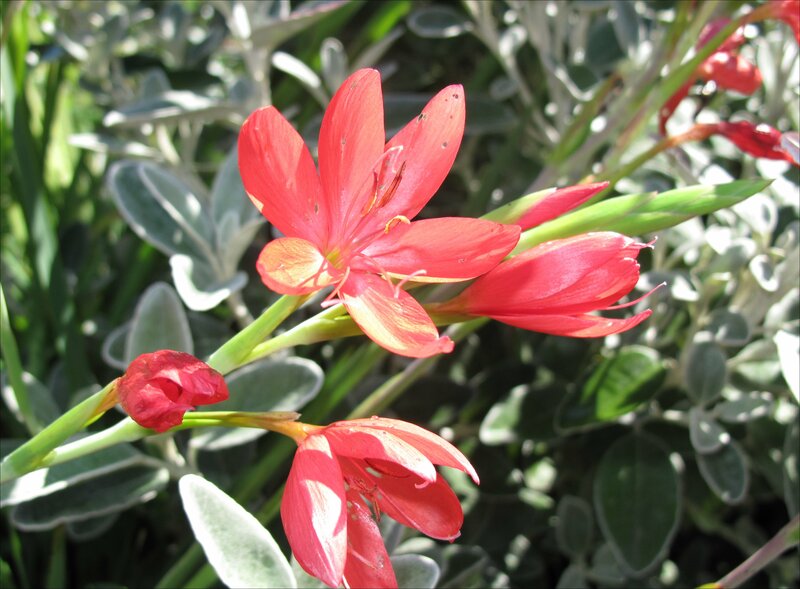 For more on Hesperantha coccinea, aka “Kaffir Lilly,” see my previous post. This entry was posted in Plant Picks by Bart Arenson. Bookmark the permalink. I like the color. Nice that it is blooming in January and again in September.